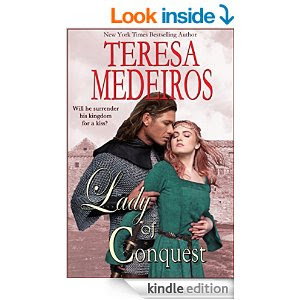 Teresa Medeiros has been a favorite author of mine for many many years. There aren't too many of her books that I haven't read at one time or another and then ended up reading them a second and even a third time. I also bought Shadows and Lace at the same time I bought this--Shadows and Lace is actually Book 1 in the Brides of Legend series--but it reads just fine as a stand alone!! I also happen to love historical romances where there are strong handsome men--but even stronger women who manage to subdue the beasts!! It is said that true love never runs smooth and the hero and heroine of this book have their ups and downs several times. The sub characters on Medeiro's books are always entertaining and the villains--oh boy her villains. Do I think you should read this book--A resounding YES and while you are at it any other of her books you can get your hands on!! What a great book review as I am always after that next interesting read! I will have to check out this book more soon! That sounds like a great book for me to read at the beach this summer. I am adding it to my list. Beach time is here so I am looking for ideas for books. This looks a winner. thanks for the review. Sounds like a great read. I will add this to my must read list. I love historical fiction so this book (author) are definitely some that I need to consider for my summer reading. This sounds like a great addition to the summer reading list! Thanks for the review! Oh this one sounds interesting. I love stories like this. I love a book with a strong female lead. Thanks for the review! You know a book is good when you can read it over and over. I have to check this one out. I am always looking for new books to read. Thanks for the review. You make such detailed reviews. I like the way you write. This book sounds really good if that's the type of subject you like. Very well written. Thanks for sharing. This sounds like an amazing historical love story indeed and just the kind of book my mom loves to read also. I will have to look into reading her stories for sure. Thanks for sharing. Sounds like a great book! I will have to add this book to my reading list! I love historical loves stories! Great mommy book to read! Sounds like a great rread! Adding it to my list! Great review of the book as always! 'Will he trade his kingdom for a kiss?' is a question a lot of men in power still seem to struggle to answer. This sounds like a fun one! I'm looking for some new & fun reading over the summer, and this sounds like I would really enjoy it. This book sounds like an amazing read! I have been looking for some new romances to read! What a good beach read! I havent read a romance book in a long time! This book sounds like there is a lot of drama in it and one that you would want to read all the way through at one time to find out what else will happen next. She looks like a fun author - maybe we could even be friends :) Thanks for the book idea! That is totally the perfect kind of book for a poolside read! The cover is very intriguing and I like the storyline! I love reading fantasy fiction. This one sounds pretty interesting! How awesome it is to see you review a book by an author you are such a big fan of. I especially love your take on strong women who take care of business, but you knew I would. I hadn't heard of her , so I feel kinda bad considering It appears she has a decent name for herself! Sounds like a good book, great review! Thank you!